The Karankawa and Lipan Apache Indians once lived in this area. It was the site of several settlement attempts in the 18th and 19th centuries. In 1858, the town of Lagarto, now a ghost town a few miles northwest of the park, evolved from a Mexican settlement of grass-thatched huts. Lagarto began to steadily decline when its leaders rejected building a railroad through the community in 1887. Little remains of the town today. The Nueces River was the disputed boundary between Texas and Mexico after the Texas Revolution. The Rio Grande became the boundary at the end of the war between the two nations. This area officially became a part of Texas in 1848. In Jan­uary 1929, con­struc­tion of La Fruita Dam a­cross the Neuces River formed a reservoir called Lake Lovenskiold. The dam failed in November of that same year. President Franklin Roosevelt’s New Deal paid to rebuild the dam in 1935. The new reservoir was named Lake Corpus Christi. By the 1940s, silt was filling the lake, reducing its storage capacity. Landowners in the proposed flood pool opposed a new and larger dam. Lawsuits delayed construction for many years. The local water supply district finally won a favorable court decision. The present dam was completed in 1958. Lake Corpus Christi is now one of the largest artificial bodies of water in Texas. The lake covers 21,000 acres, with a capacity of 300,000 acre feet at the spillway elevation of 94 feet above sea level. CCC workers building the refectory. Lake Corpus Christi State Park is a 356-acre park located in San Patricio, Jim Wells and Live Oak counties, southwest of Mathis. The state leased the property from the city of Corpus Christi in 1934 (until 2032) and opened the park later that same year. Civilian Conservation Corps Company 886 developed the park between 1934 and 1935 on a cove of the lake. CCC buildings included a bathhouse, park residence and a refectory; only the refectory remains. CCC men used cast blocks of local caliche for the Mediterranean-style building. They cast the blocks in various sizes, and then laid the blocks to resemble cut limestone. 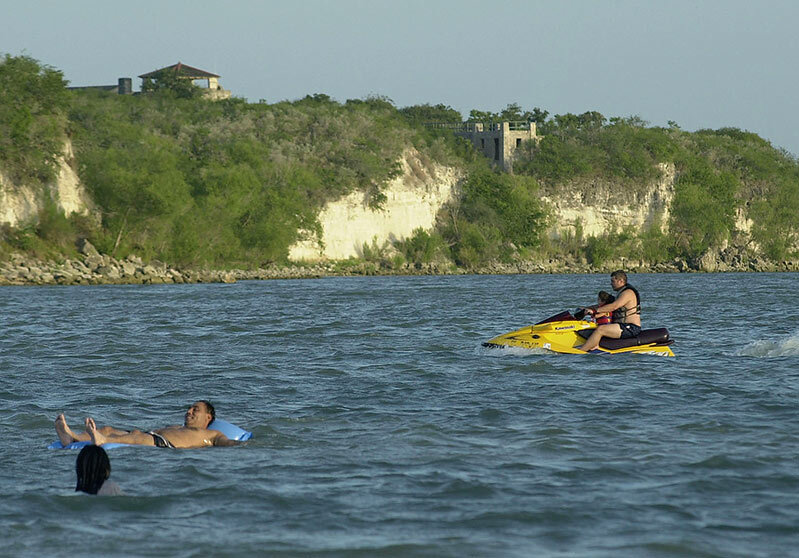 Learn more about the CCC’s work here on The Look of Nature: Lake Corpus Christi.